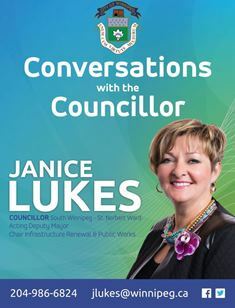 I sit as Chair of what I believe is one of the most fascinating committees in the City of Winnipeg: the Standing Policy Committee on Infrastructure Renewal and Public Works (SPC IRPW). This Committee oversees many transportation related issues (active transportation, transit, roads and more) in our growing city! Starting in January, 2016, I will be hosting a series of six ‘Transportation Conversations with the Chair’ at 12 noon on the third Thursday of each month! From January to June, these casual conversations over the lunch hour will focus on relevant transportation themes and topics. I’ve invited Councillors Sharma, Dobson and Gilroy (members of SPC IRPW) to attend if their schedules allow. We welcome anyone who is interested in talking transportation. Perhaps these informal discussions may even lead to some larger discussion events! Watch my website, twitter and Facebook for reminder notices!